Why my Favourite Colour is Yellow! It’s rainy, windy, dreary and very grey outside. Well it is January I suppose. Being a sun-lover, Mr. C hates this time of the year and moans like crazy about wanting sunshine and warmth every time his weather app disappoints him with its fairly predictable predictions. We live in The UK – a temperate climate with very few weather upsets, after all. It rarely gets too hot and it rarely gets too cold. I don’t like it when it’s ridiculously hot or humid, but nothing else really bothers me to be honest. Yes it’s dark and grey outside but so what? There’s an antidote to that if you want one. The road is grey and the sky is grey and it seems to be as if every other car on our street and on the roads in general is grey or silver or graphite or bleuurghhh. Not outside our house though. Nope, we have a yellow car. 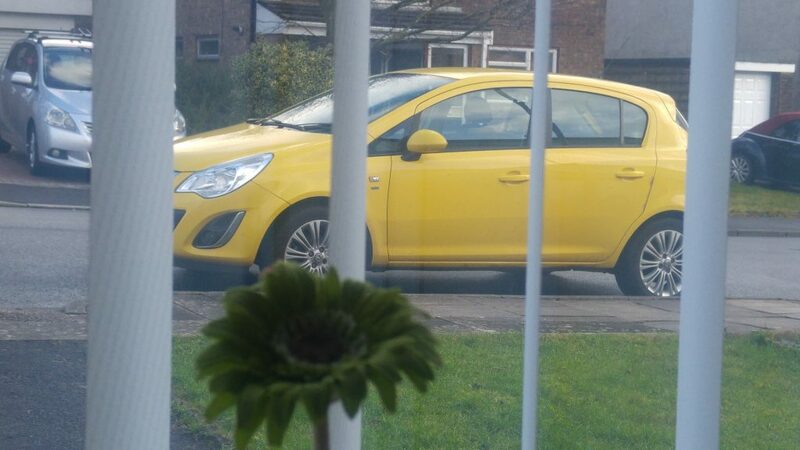 It’s a bog-standard pretty ordinary Corsa but it’s a smiley, happy, yellow one which draws the eye and makes you think sunshine and happy thoughts. Well it feels sunshiney to me anyway. Yellow has been my favourite colour since I can remember. The yellow-trimmed ‘Bubble Umbrella’ I had for Christmas when I was eight ranked up there with the SpaceHopper I had the previous year. I was on cloud nine Christmas morning that year, walking down the street in the rain with my sister and her green-trimmed brolly. It was one of the few Christmasses ever that I can remember getting dressed before midday! We couldn’t wait to get out in the pouring rain. 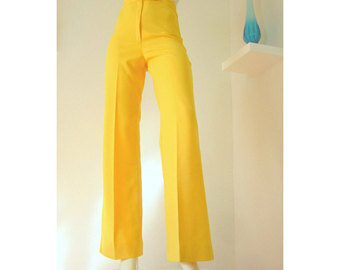 Seventies fashion has a lot to answer for but that doesn’t include my first ever bell-bottoms. Those high-waisted yellow trousers really were the bees-knees and twinned with my orange, turquoise and white platforms were a sight to behold. Trekking up Llangynidr mountains with my Dad to see a black-headed gull colony (O h he loved his bird-watching did Dad!) in February may not have been the place or time to wear them but I was eleven for goodness sake and I was going to wear those yellow bellbottoms every possible opportunity! I cried my eyes out when I fell and ended up knee-high in the blackest, muddiest, boggiest marsh ever. The yellow never looked as bright after half a dozen hot washes – no idea why! And then there was one of the fab ‘statement pieces’ I bought for my first house. A large and very gorgeous, muted yellow crackled-ceramic lamp base from Habitat which paired with a jade (very ‘in’ in the mid-80s) lampshade remained a living-room favourite for many years. A real pop of colour and nobody else I knew had one. When Baby Number One was on the way and thoughts turned to nursery colours, I had no doubt that I wanted primary-yellow curtains. 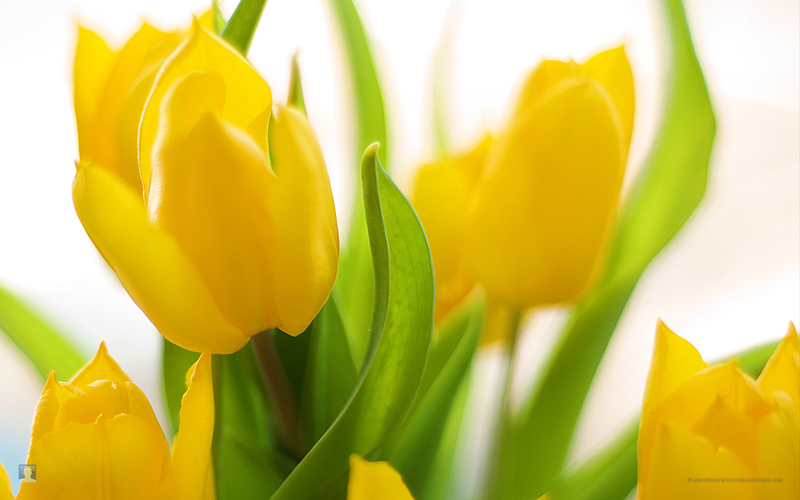 Whatever the gender, yellow would be just fine and what’s not to love about yellow. I vaguely remember pocketing a paper serviette from a local restaurant (The Villagio in Whitchurch in Cardiff was sporting a perky yellow colour at the time) and then taking it out in my bag with me to match up the colour when we went ‘curtain shopping’. John Lewis in Bristol came up with the goods and with yellow curtains in hand we were on our way to a primary-coloured nursery to suit whatever baby we ended up with. As it happened it was a girl followed by a couple more girls and yellow was just perfect. Grandchild Number 1 is imminent and true to form, one of the first things I’ve bookmarked for him or her is yellow too. It’s a really sweet organic cotton romper in a muted yellow – ideal for a Master or a Little Miss! See now people laugh when I say this but the best and most memorable car I’ve ever had, was my yellow Ford Ka in the late ’90s. I’m very much a car is a car and if it gets you from A to B who cares what it is, sort of person. 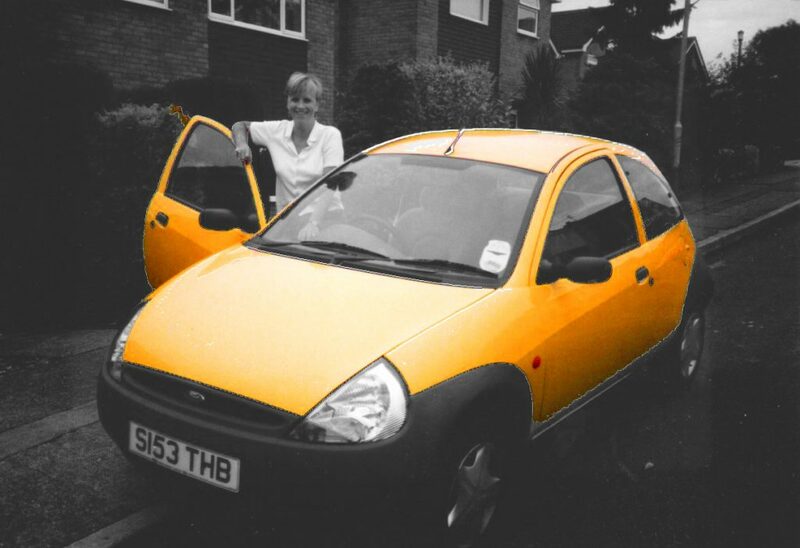 Or at least I thought I was until I had that yellow Ka. It’s only when you drive a bright, distinctively-coloured car that you notice how everything else on the road is so grey and boring. There were only a few other cars the same colour as mine that we ever saw around our area at the time and we actually used to wave to each other. 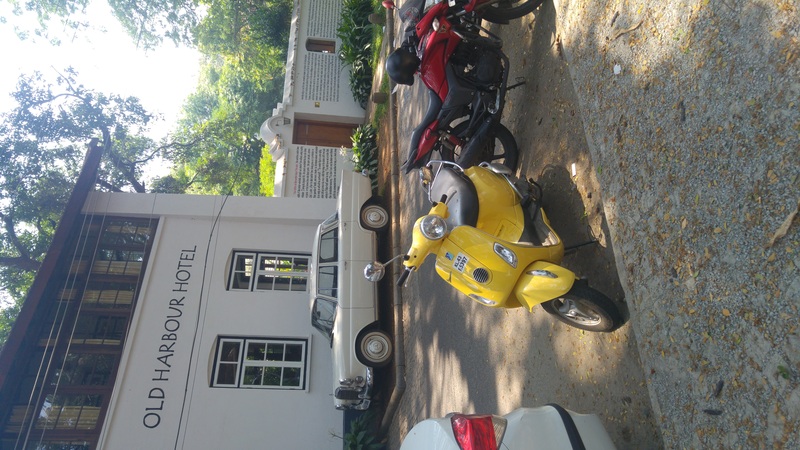 Other yellow cars used to make me and the girls, strapped-in in the back, laugh and smile. Ok it might sound a bit weird but surely anything that makes you smile is a good thing?! 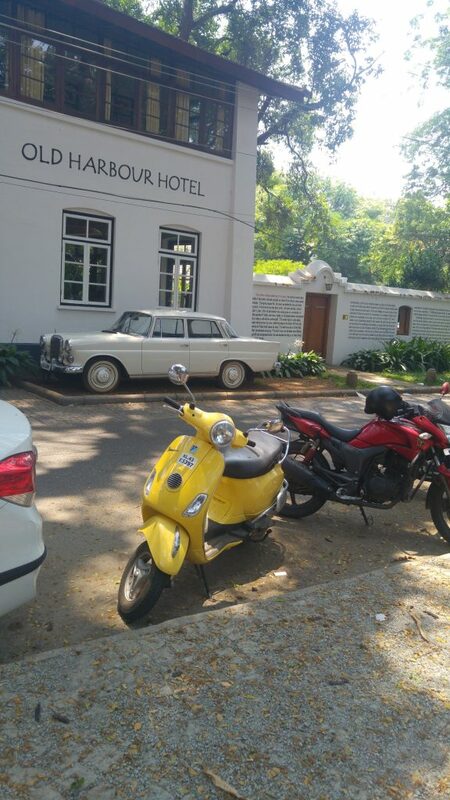 And counting yellow cars is a great car-game at any age – or is that just our family? Anyway, where are we now then on the yellow front? 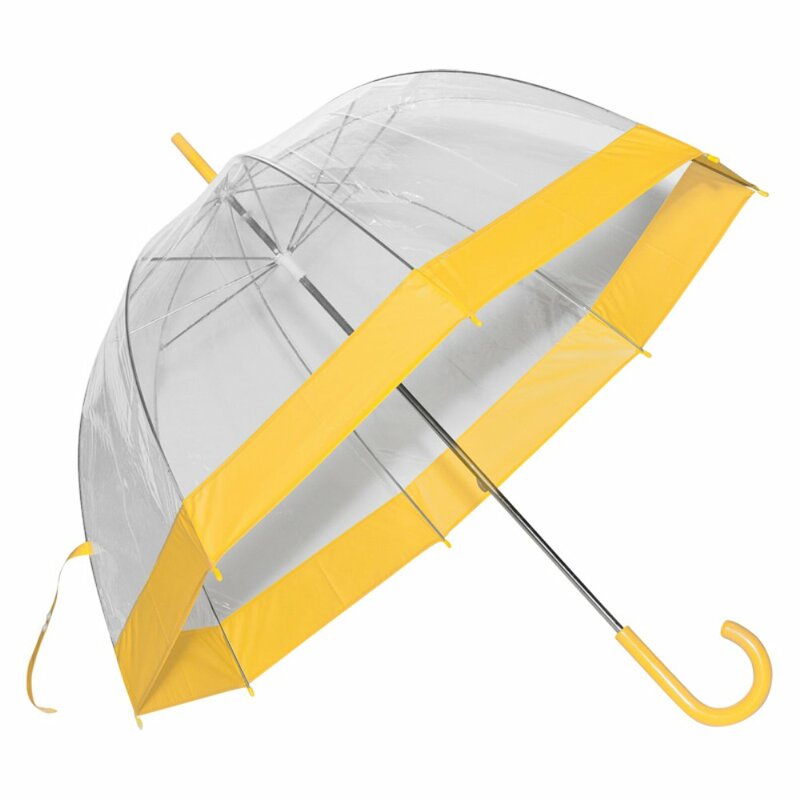 Well I currently have a cute little telescopic yellow umbrella in my bag (from Lake Garda don’t you know?!) and picked up an amazing bargain in Tescos the other day too. A lovely swing coat in a cool, on-trend mustard to act as a counter to the sea of black in my wardrobe. 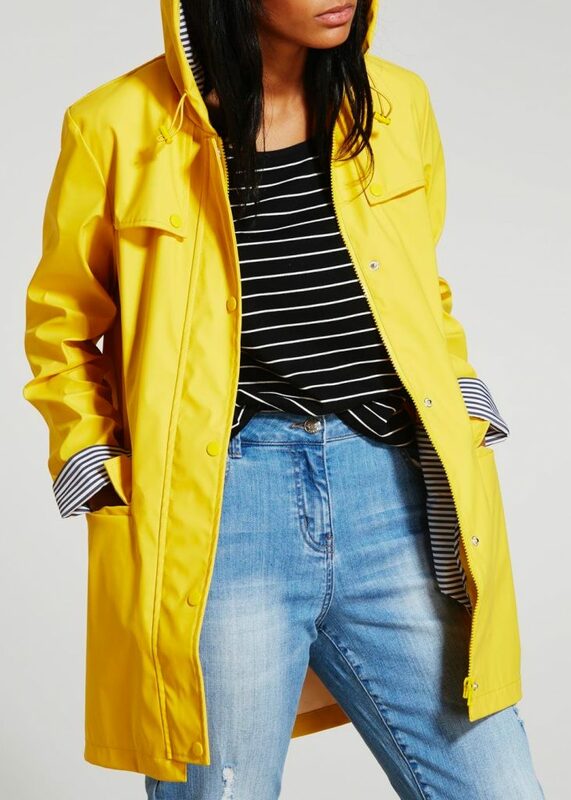 Oh and I nearly forgot I ditched my cerise Mountain Warehouse kagoule for a fab yellow rain mac, in a cocktail-fuelled spontaneous purchase walking past Matalan last Summer too… so yes, I do still love all things yellow!